Dallas, Texas - February 20, 2018 The Medicus Firm, a national healthcare recruiting firm specializing in permanent placement of physicians and advanced practice clinicians, released its annual Physician Placement report this week, summarizing physician placements made in 2017, as compared to prior years. revealing a number of ongoing physician workforce trends. The report provides an overview of hundreds of placements made at more than 250 healthcare systems and hopsitals nationwide, in 52 specialties including nurse practitioners (NPs) and physician assistants (PAs). "There were no huge surprises from the data this year as compared to recent years," states Jim Stone, President of The Medicus Firm. "Primary care searches and placement activity continue to dominate a large proportion of healthcare hiring, and most employers continue to hire the majority of physicians into employment settings, as opposed to private practice or self-employment. Average physician signing bonuses accepted last year grew a bit more than expected, to $30,000" Stone adds. Top Specialties – Primary Care Tops List, Yet Again - Primary care comprised 39 percent of 2017 placements, up from 35% last year. Family practice was the most frequently placed specialty for the 4th consecutive year. The second-most frequently placed specialty was internal medicine, up from third place the previous year. Hospitalists jumped up to third most frequently placed specialty, up from 5th last year. 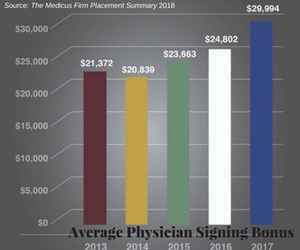 Signing Bonuses – All Time High: The average signing bonus accepted by physicians reached an all-time high in 2017. Signing bonuses have grown in popularity and size over the past few years, from the low $20,000 range in 2011, to nearly $30,000 in 2017. The largest signing bonus paid in 2017 was $200,000. Placements by Training – American Trained vs. Internationally Trained: The percentage of internationally trained physicians placed dropped to 24%, down from nearly 32% in 2016. The reason behind this trend is unclear, especially since the physician workforce demographics have not changed as such. Additionally, 6.3 percent of providers placed in 2017 were on either a J1 or H1-B visa. Osteopathic Medicine Placements Increase: Placements of doctors of osteopathic medicine (DOs) increased to nearly 15 percent in 2017, from eight percent the previous year. Hospital Employment Continues to Dominate Physician Hiring: Very few physicians were placed into a private practice (self-employed) setting. Hospitals placed nearly 57 percent of the total 2017 placements, followed by group practices (33 percent). Furthermore, 88 percent of all physicians placed in 2017 were employed, primarily by hospitals and groups. Nine percent of physicians accepted a net income guarantee, and 1.8 percent accepted a gross income guarantee. "Physician placement data offers some useful insight into the hiring patterns of employers, and job search trends of physicians each year, as compared to previous years," states Jim Stone. "Employers always look forward to reviewing this information when planning their recruiting strategies, and the information provided in this publicly available report is just a thumbnail sketch of what we can share on an individual basis with healthcare employers. Depending upon an employer's location and search needs, we can provide more specific, customized data, including average compensation packages accepted, typical time to fill comparable searches, and most effective candidate sourcing and marketing strategies, based on prior successfully completed searches, to help healthcare employers and recruiters gain further insight into recruitment trends in their particular area of the country and specialty of need," Stone states. He adds that the size of the recruiting team and access to innovative technology available through the firm's parent company, M3 USA, enable The Medicus Firm to produce reliable, insightful data on hundreds of searches nationwide. About The Medicus Firm: The Medicus Firm, established in 2001, provides award-winning, peer-reviewed physician search services to hospitals and healthcare employers across the country. Based in Dallas, TX, the firm also has offices in Boston, MA, and Atlanta GA. The Medicus Firm specializes in permanent placement of physicians and advanced practitioners in all specialties and types of communities nationwide, in a variety of practice settings including hospitals, medical groups, community health centers, national and regional health systems, and academic medical centers. The Medicus Firm’s Physician Leadership Division provides physician executive search services. In 2016, The Medicus Firm became a subsidiary of M3 USA, which is part of a global healthcare community of more than 4 million physicians worldwide. Learn more at www.TheMedicusFirm.com.